Plants erect, up to 40 cm tall, cartilaginous, dark brownish-red; prostrate rhizomatous holdfast bearing several erect axes; axes cylindrical in basal regions, compressed above, up to 1.5 mm wide and about 0.8 mm thick, pinnately (oppositely or alternately) branched; branches not constricted at bases, often conspicuously geniculate, especially in distal (younger) regions, often overlapping each other. 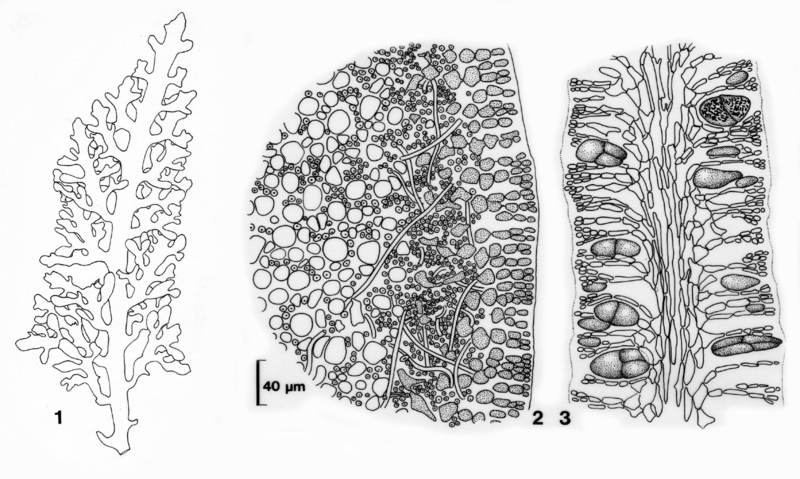 Anatomy of small (to 8 µm diameter) outer cortical cells and slightly larger (to 10 µm) inner cortical cells interspersed with large bundles of rhizines; medulla of large (to 25 µm diameter) rounded cells interspersed with isolated rhizines or small bundles of rhizines. 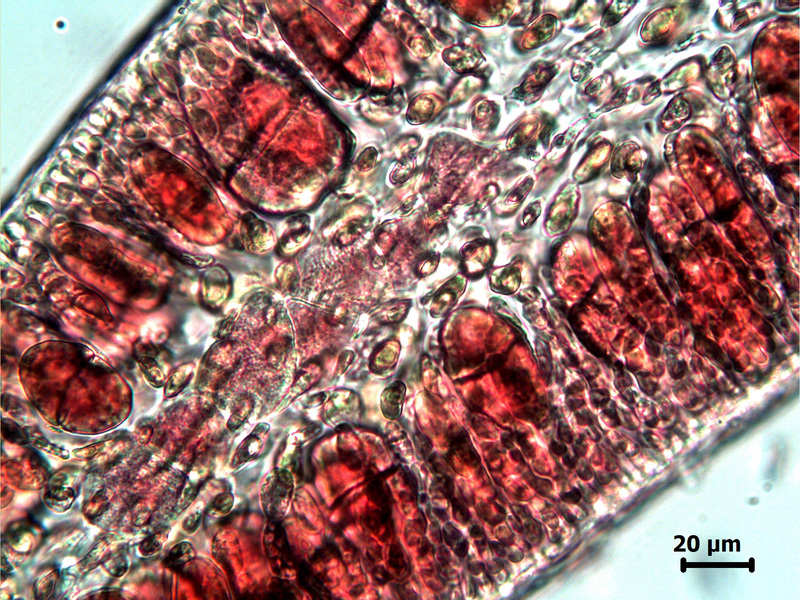 Tetrasporangial sori in spatulate terminal branchlets. Cystocarps single in terminal branchlets, often with terminal sterile beak. Found on rock from the sublittoral fringe to at least 10 m depth. Recorded from just north of Cape Town (Melkbosstrand) to the southern border of Kwazulu-Natal (15-48). World distribution: Also recorded from Madagascar, Mauritius, Amsterdam Island, Oman (Silva et al. 1996). A record from the Philippines is questionable (Silva et al. 1987 in Stegenga et al. 1997). Type locality: Cape of Good Hope (Norris 1992). Note: Norris (1992) notes that some G. capense specimens are difficult to distinguish from fertile specimens of G. abbottiorum, and suggest that either environment or hybridization may be responsible. Gelidium capense, cross section of thallus. Gelidium capense, LS of blade showing tetrasporangia. 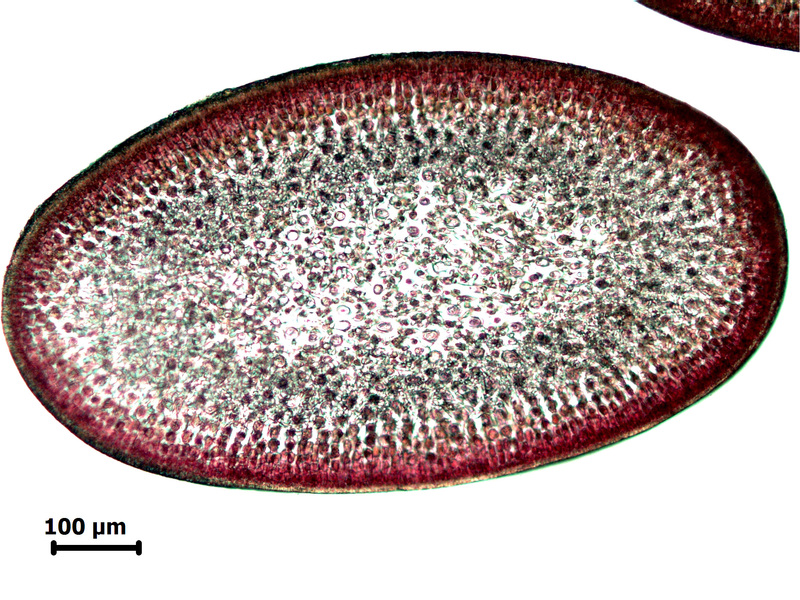 Gelidium capense, cross section through male plant showing clear layer of spermatangia around outer surface. Gelidium capense. 1. Thallus apex. 2. Cross section of main axis. 3. 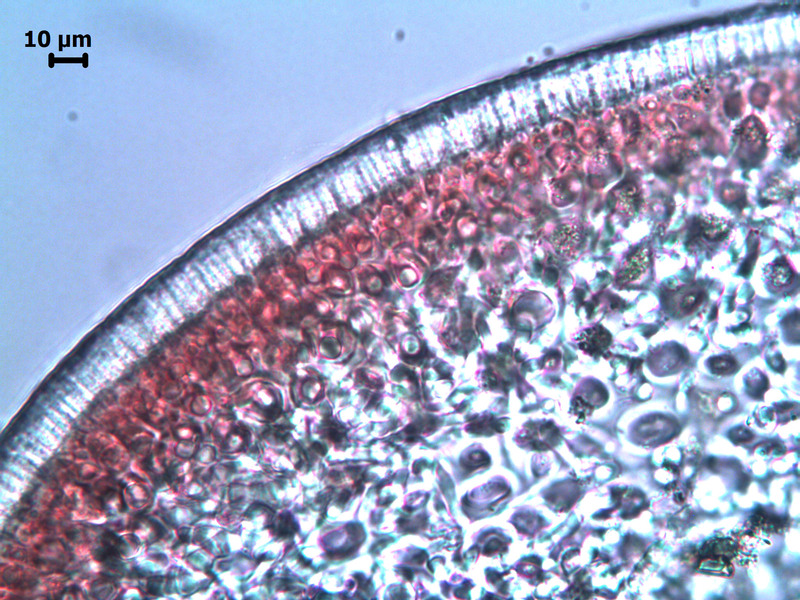 Longitudinal section of tetrasporiferous branchlet. Reproduced from Stegenga et al. (1997). Norris RE 1992. 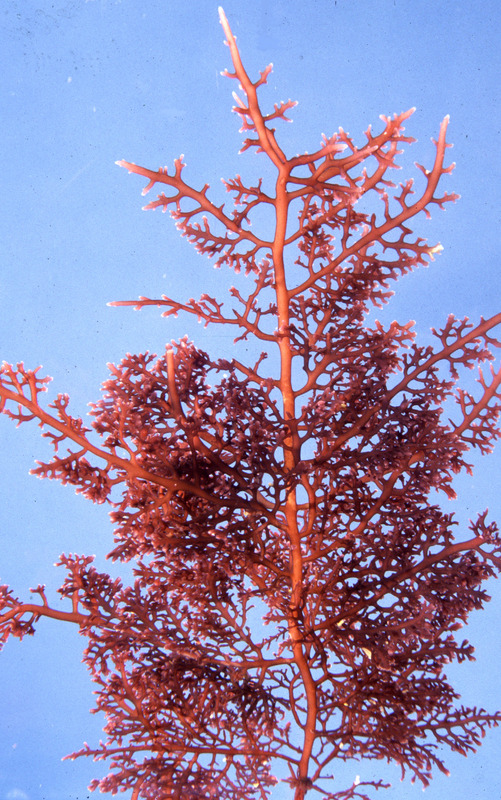 The marine red algae of Natal, South Africa: Order Gelidiales (Rhodophyta). Memoirs of the Botanical Survey of South Africa 61: 43 pages. Silva, P.C., Meñez, E.G. & Moe, R.L. 1987. Catalog of the benthic marine algae of the Philippines. Smithsonian Contributions to Marine Sciences 27: [i-ii] iii-iv, 1-179, 2 figs, 1 table.